The flash mob has emerged as a method for marriage proposals, political statements, and sheer artistic expression. 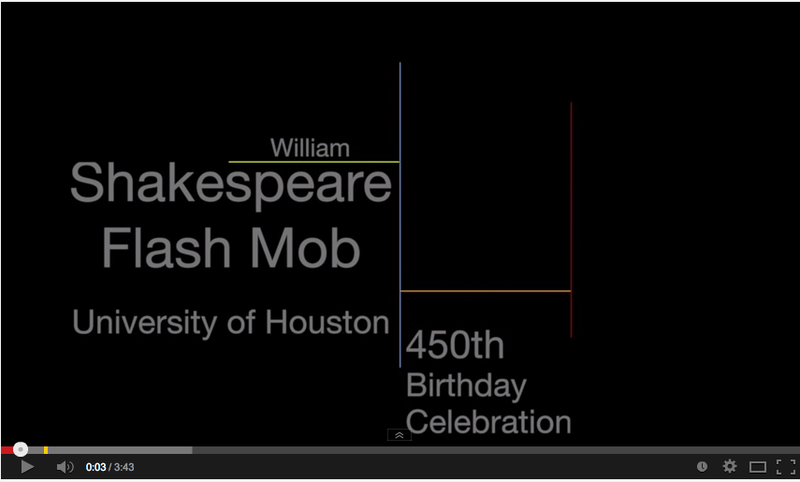 This year, the flash mob pays tribute to William Shakespeare in celebration of the bard’s 450th birthday. The Folger Shakespeare Library recently extended a challenge to schools, theatres, and the general public to recreate the iconic balcony scene from Romeo and Juliet in a flash mob. The challenge was met with 28 dramatic offerings from Hawaii to New York to Ottawa. 1. Use the corrected balcony scene script. It takes about 3 ½ minutes to perform. 2. The scene needs to be performed chorally – all the Romeos must speak together and all the Juliets must reply together. 3. The Juliets must be elevated and the Romeos standing below them. 4. Record the scene on video and upload it to YouTube. Largest Balcony Scene:(a new World Record) submitted by Jill Burdick-Zupancic at Thomas Jefferson HS for Science and Technology in Alexandria, VA. The high school broke the previous record of 160 at the Boston meeting of NCTE in November 2013 with 188 participants. Interesting Location: Ann McCormick’s students from the Brooklyn International HS performed their scene on Ellis Island in NYC. Bravest Mob: A group of twelve 8th grade students from the Friends School in Baltimore. Most Passionate Mob: A small group from Westland Hialeah (FL) Senior HS put lots of energy into their scene. Other flash mobsters, like the Austin HS Mustangs, incorporated live music in their rendition, while St. Mark’s HS from Wilmington, DE performed the balcony scene in their school foyer while wearing their uniforms. Some groups paid tribute to Shakespeare in mass numbers, and others, like the Marist School English Department from Atlanta, GA, put forth a valiant effort with three brave Romeos serenading a handful of Juliets. The public and oral nature of the flash mob proves an appropriate testament to Shakespeare by truly capturing the bardic elements of his works. Let’s hope that future flash mobsters stick with scenes similar to this one from Romeo and Juliet, and do not aim to recreate some of Shakespeare’s more gruesome scenes in their local shopping mall. View all of the submissions on the Folger's blog.